Guided Mark-Up: Cervical Spine Measurements - Website of metron-md! 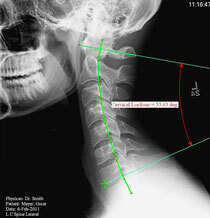 Cervical Lordosis: The angle between two constructed lines: one along the major axisof C1, and the other along the inferior side of the body of C7. Some literature argues the ideal value is 42 degrees.